Four University of Bath students and one famous graduate will be hoping to get their hands on the Women’s Premiership Rugby trophy this weekend. MJ Church sporting ambassador Sydney Gregson and Talented Athlete Scholarship Scheme (TASS) trio Lottie Holland, Jessie Hood and Chantelle Miell are all in the Bristol Ladies squad for Sunday’s Premiership final against Aylesford Bulls at Sixways Stadium in Worcester (3pm). Coach Education & Sports Development graduate Izzy Noel Smith, who recently helped England complete the Grand Slam in the Women’s Six Nations, is also a key member of a Bristol outfit determined to clinch the national title for the first time. Gregson provided a stunning assist and Miell was on the scoresheet as Bristol, who finished top of the regular league table, booked their place in the final with a 43-10 win over Saracens Women. “The club has never reached a Premiership final in its history and we are extremely excited to showcase what we have been working towards throughout the season,” said Gregson, who is supported by a Trendell Sports Scholarship. “Personally I am eager to get onto the pitch with a very talented squad with the aspiration to come out as Premiership champions. Gregson, Holland and Hood are all Sport Performance students, while Miell is studying Sport & Exercise Science. 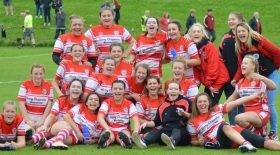 All have played for England at U20 level, with Miell also representing the Red Roses at 7s tournaments in Australia and the United States this year. Hood, who has progressed from Bristol’s 2nd XV to the senior starting line-up this season, said: “It’s great having the four of us training together at the University as part of both the Bristol and England EPS progammes. We aspire to be the best players in the league and it is helping to raise our standards. “Sydney, Charlotte and Lottie are my closest friends here and are so supportive. Izzy has also been a great help, especially at this time of year when I’m juggling training with completing my dissertation, as she has been through it before. TASS funding allows Hood, Gregson, Holland and Miell access to strength and conditioning coaching with Luke Vella in the world-class gym at the University of Bath and physio support from Barry Edwards. They also receive lifestyle support through the Team Bath Dual Career Programme. “The Premiership is semi-professional and having the support of TASS and Team Bath helps us perform to that standard,” said Hood. “It is incredibly helpful being able to access physio treatment so quickly and the strength I have gained training with Luke has made a huge difference. Applications for the 2017-18 Team Bath Dual Career Programme are now being accepted. For more information, visit www.teambath.com/athlete-zone. 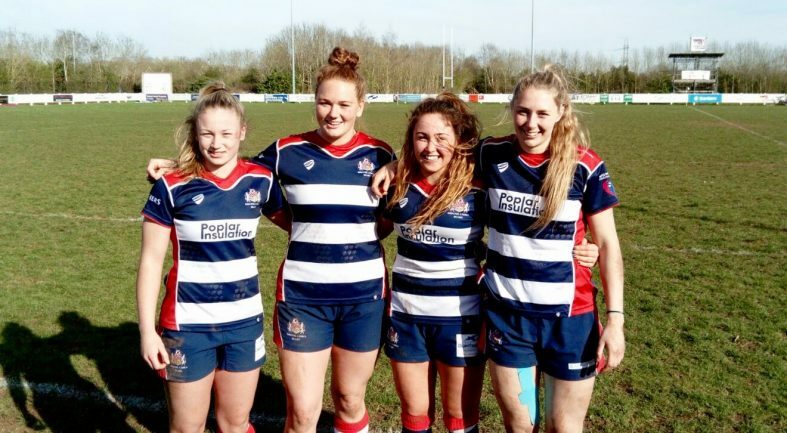 Lead photo shows University of Bath students (from left) Chantelle Miell, Jessie Hood, Sydney Gregson and Lottie Holland following Bristol Ladies’ semi-final win against Saracens.